We started a very interesting and challenging project in Costa Rica this year (harvest 2015/2016) along with Marianela Montero, a coffee producer and now our product manager for Costa Rica. Marianela is 22 years old, born and raised at her family’s farm, Don Eli, and have just decided to stay in coffee and try to make a difference. She will work on the ground with producers throughout the season, and follow up on everything from what’s going on on production and processing at the farms, chasing quality, collect stock lots from the producers, cup and do pre-screening and follow up on milling shipment. Marianela and her family visited us last year at our Lab in Norway. Since then we established a good relationship. The most fascinating thing with Costa Rica is the awareness of lot separation and different processing and preparation methods. You’ll find great representative coffees of everything from fully washed, different levels of honeys as well as super clean naturals. Even if the coffees can be expensive due to cost of production we totally find it worth it. We visited Marianela and Don Eli in Terrazu for the the first time in January 2016, and later on in March. At that point we started to discuss the idea of a more sustainable purchasing and quality program in Costa Rica. It’s a about getting closer to the producers and focus on quality, transparency and improved quality control. This should be followed up before, under and after the preparation and processing. During our first visit in January we cupped some great coffees, that Marianela collected from producers in her surroundings, and started to identify coffees and meet growers. The potential we found was great and at that point we started to discuss and look in to how to systematically work over time and get closer to the local producers. We decided to get Marianela onboard full time as part of the Nordic Approach team. The harvest 2015-2016 was delayed for Costa Rica. Usually the harvest in the region we are currently working in, Tarrazu, begins mid December and finishes mid March, this harvest lasted until mid April. Many of the high altitude coffees weren’t ready to cup before late April and May and at that point they were still very fresh. We have our shipments sorted and on the way right now. About 350 bags from different producers and preparations going to Europe, and about 150 bags of various micro lots to the US. Most of the producers we are working with are small farmers (average 5 hectares per producer) all of them have been working in coffee farming for almost all of their life, which means this activity is a legacy. These producers own their own farms and most of them have their own washing station (micro mill). 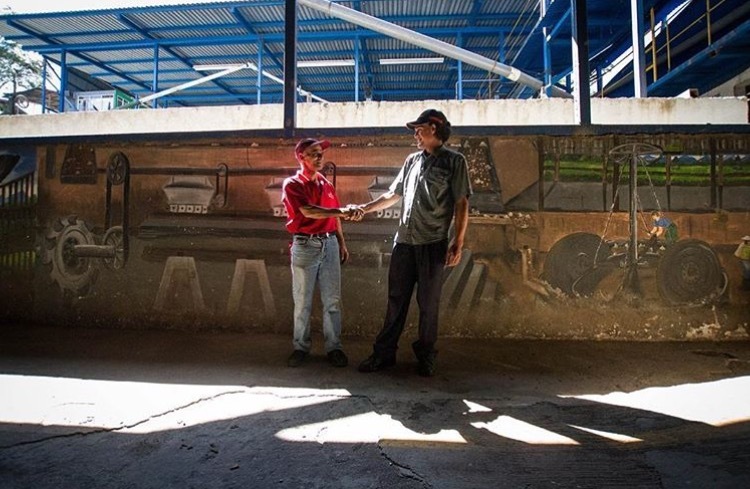 The micro-mills in Costa Rica have become a family business and are based on family work. Usually producer families are relatively big, and they all help out during the harvesting season with the mill and farm work. Some of these producers have around 8 years experience processing their own coffees at their micro mills. Some other farmers are very new and have in between 1 and 3 years experience processing their own coffee. We would like to work together for many years with these producers if/when they have the mindset and ability to be consistent and hopefully improve year by year. The importance is to get the growers to increase the quality and to think of this partnership as a mid-long term project. We know in coffee we need to be patient and besides getting great coffees out of it, we want to help these producers to maximise the potential, get better premiums through cup quality and consistency. By adding on Marianela to the team, we believe we can work together with producers and “guide” them to get a more customised product. One of the keys to make this project successful is to work as transparent as we can. We want our customers and everyone to know how much it actually takes to produce a great cup of coffee and how much every part of the supply chain is earning. Costa Rica is kind of a high cost country these days, and to make it sustainable we believe it’s important to pay fair and good prices to the producers as they have to make a living out of this. We need to motivate them to keep up the good work. The good thing is that the coffees can be amazingly good when grown and prepared well. For over three generations the Montero family has been producing coffee in the stunning mountains of Tarrazú, Costa Rica. Sitting at an altitude of 1,800 masl “La Pastora” micro region is rich in volcanic soil and known to offer some of the best Costa Rican coffee. Eli, the grandfather, worked throughout his childhood in coffee, and so did his son, Carlos Montero. Their passion for coffee coursed in their veins, but it was impossible to ignore the hardships in the coffee business. And while Carlos watched his father struggle, he set out to create opportunities for himself and ultimately he took over the farm. Today, Carlos and his entire family are deeply involved at Don Eli Coffee farm and micro mill. But in the harvest year of 2014 to 2015, Carlos and his family took their biggest risk yet. It was their first year as specialty coffee producers. But Carlos explains that this way they can regulate their coffee business, focus on innovative processing methods and ensure quality in each coffee bean. They were leaving the mass production concept behind to uphold the “quality over quantity” mindset. Carlos is aware and is working to get certifications for his farms like NAMA Café, he knows how important it is to have a great soil without chemicals, so he is working on sustainable practices in his farms, and as an example of that he has a nano lot where he hasn’t used any chemicals for many years and want to keep this nano-lot named “Chamaco” as an experiment for the future. Every year Don Eli Coffee is focused on delivering the best of what Costa Rican soils have to offer. “The NAMA-Café is an initiative aimed at mitigation and adaptation to climate change in the coffee sector, promotes low emissions of greenhouse gases, aims to reduce environmental damage caused in coffee production by encouraging the adoption of new technologies, and improved production practices, aims to increase the efficiency of small farmers in Costa Rica. It contributes to improving the quality of life of producers and their families across the competitiveness of the coffee sector. ” According to this in 2020 all the countries willing to sell coffee to Europe will need this certification. Carlos Montero is “El Jefe”. From properly treating the farm’s soil, to overseeing coffee pickers, to ensuring the best coffee cherries get delivered to the mill, Carlos is the boss while Lucia, his wife, fuels to the coffee family. From preparing her famous empanadas and tomato soup to running the household, Lucia doesn’t know the definition of rest and embodies “mi casa es su casa.” Carlos kids: Marianela, Jacob and Mariajose work in the family business too. Jacob is 21 years old, slap on some rain boots when you are visiting Jacob at work. He oversees the wet-mill processing. From counting the “cajuelas” or crates of coffee cherries, to manning the machinery and the depulping process, Jacob is key to coffee preparation. He is also currently studying economics at his school, which comes useful in helping the family business with the accounts. Mariajose is 17 years old, no one toughs it out like Maria does in the harvest season. She oversees the African drying beds, which call for extreme attention to detail inside greenhouse-like tents. In addition to measuring the moisture, she also battles the elements, and rakes the beans every hour. The drying process is one of the steps that heavily impact the coffee quality. Good thing Maria can handle the pressure, as she hopes to become a pilot one-day. Soil:volcanic, ultisols,high acidity and low base. La Cruz micro-mill is a family project located in Alto Canet in Tarrazu with an average annual rainfall of 2400 ml and temperatures oscillating the 24°C till 12°C. 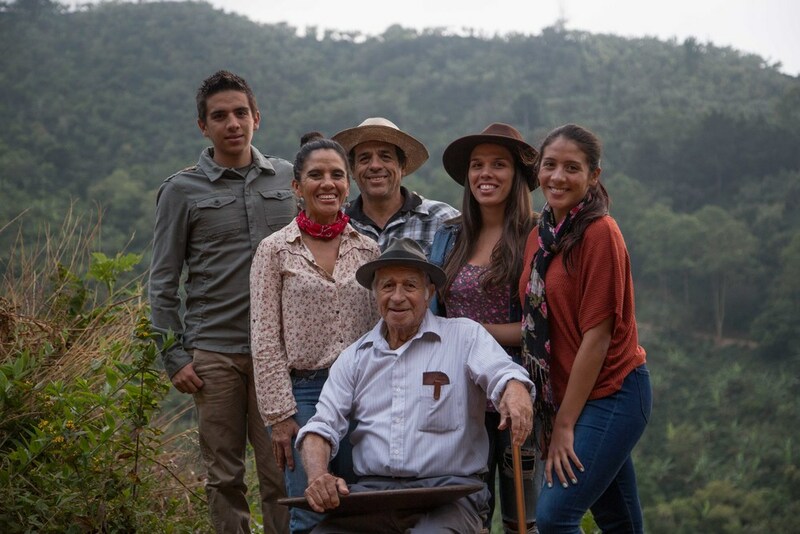 The coffee production has been a legacy in the Zamora family, don Egidio Zamora and dona Ligia Picado have been working in coffee since 1970 and they taught and transmit their 3 kids: Jacob, Esteban and Felipe their passion to grow coffee. Nowadays Egidio’s kids have taken over the family business and they started the micro-mill project to process their own coffee. The engineer Esteban Zamora knows their soils and plantations well and works the farms according with his experience and knowledge he has learned for so many years. For them it is crucial to apply sustainable practices in their farms and they are working in two different programs: “Bandera Azul Ecologica”, which is an award that rewards effort to the protection of natural resources, the implementation of actions to address climate change. Soil: volcanic, ultisols,high acidity and low base. 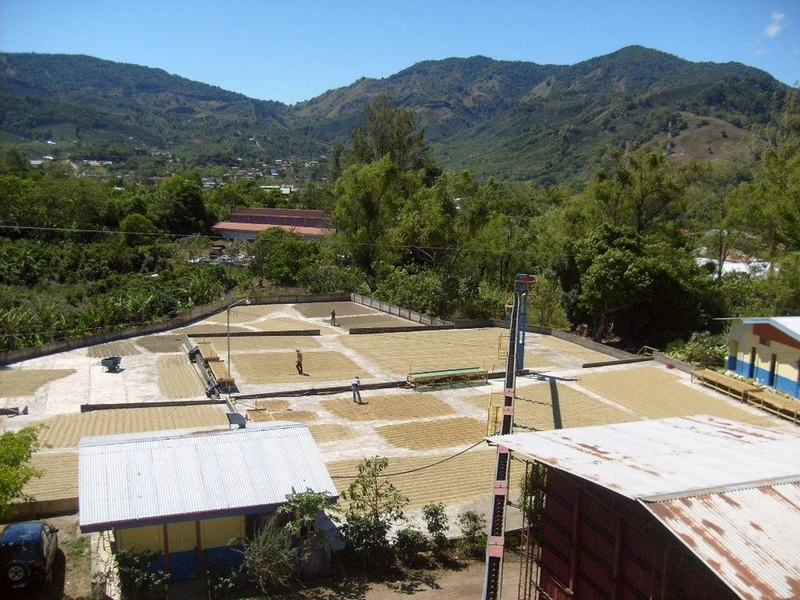 La Angostura is a micro-mill and a family business located in La Angostura, Leon Cortez at 1600 masl. 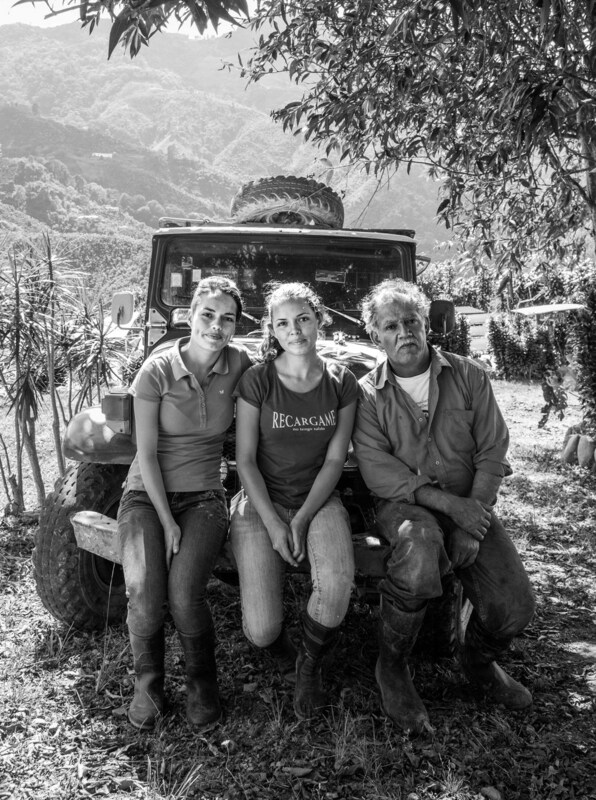 Mario and his two daughters: Arleen and Maria work hard to make sure every step in their farm is done well. Arleen and Maria are a clear example of professional young ladies, working in the farms and helping their parents with the family business. They are hard working women and do everything in the farms from growing coffee to drying coffee. La Angostura is one of the first micro-mills who started operations in Tarrazu. Mario and his 5 family members own around 6 coffee hectares and they’ve separated this land in different micro-lots planted mostly with Caturra and Catuai. They tried to apply as much sustainable practices in their farms as they can, it’s very important for them to plant different kind of fruit trees for shade and to prune every year and renew plantations. We really like Mario’s mind set. We believe they are doing a great job and they will work hard to improve and to maintain the quality over the years along with us. Soil: volcanic, ultisols,high acidity and low base,with steep slopes. Along with 4 brothers Martin started Montañas del Diamante mill in 1999. They are one of the pioneer mills for specialty coffee in Costa Rica and have good experience in processing coffee. Martins biggest farm name is “Gamboa” located in Las Nubes in Santa Maria de Dota at 1700-1800 masl. The micro climate is great for coffee in the Las Nubes micro-region. The average annual temperature in Santa María de Dota is 17.9°C and the rainfall is 2647 mm per year, together with the soil and altitude these conditions seems to be ideal and gives the coffee amazing potential. All the different micro-lots we are buying from Martin comes from the “Gamboa” farm and this year they processed 650 quintales (46 kg/bag) in total for micro lots. He is looking forward to provide us with all these amazing micro lots for the coming years. Mauricio Jimenez project is in an early phase. He still doesn’t have his own wet mill and are currently using one of his neighbours’ micro mills. The coffees are de-pulped and washed at the mill and then he dries it at he’s own place on African beds where he can be fully on top of the quality. Mauricio picked up coffee during his childhood and he´s dream since he was a child was to buy some land and to have he’s own farm. He migrated to the States to work than, after many years, he could come back to his motherland Costa Rica and make his dream come true. Despite Mauricio doesn’t come from a coffee producing family he is very passionate about what he does. He worked very hard to buy the farm and now the next goal is to have he’s own wet mill to process the coffee and to motivate the 3 kids and wife to like enjoy it as much as he does so they can all work together in this family business. The farms are located between 1800-2000 masl in a rich and productive are with good and fertile soil. San Martin farm produces around 80 fanegas (each fanegas is around 46 kg) per harvest. But since Mauricio still doesn’t have he’s own wet mill he only processed 12 fanegas of specialty to experiment and get to know the potential San Martin has. It’s been a learning process, to teach the pickers that they have to pick just ripe cherries. It’s challenging he says. 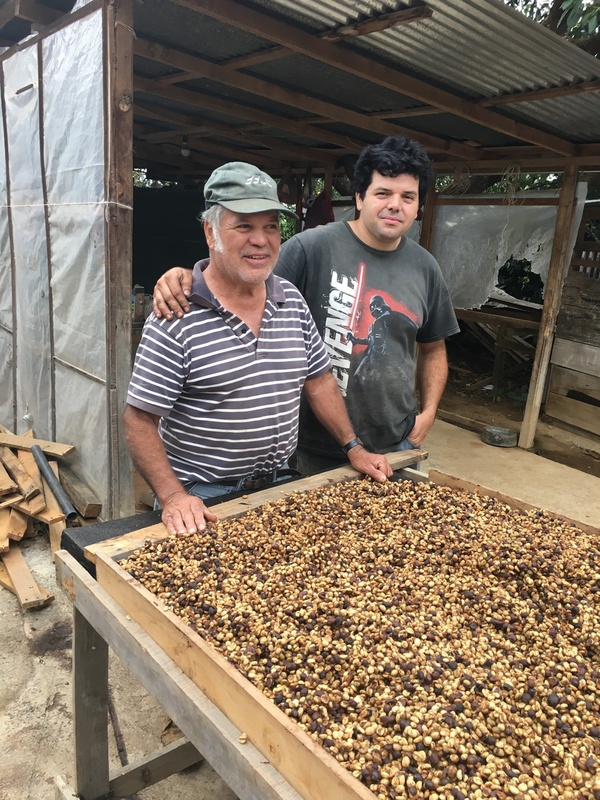 Mauricio is aware that quality on a larger scale is not going to happen overnight and he could see the progress the pickers did during this harvest. Palmichal Micro-Mill is a new project that started this harvest 2015-2016 with 30 small farmers. Located in Palmichal and processes coffees from: Palmichal, Puriscal, Tarrazu, Frailes. Palmichal’s goal is to find famers with unique coffees, perform a flawless milling process, and deliver impeccable coffee to quality-conscious micro roasters. Their model enables them to match coffees from smallholder farmers with specific quality and process requirements from discerning buyers all with full economic and physical traceability as well as timely services. This project allows to process small batches by using different drying methods such as honeys and naturals. The coffees they process here comes from individual small farmers and the premiums that the coffee receives goes entirely back to the farmer. There is an overall pre-financing of the farmers for the annual crop. This year Palmichal Mill installed the first 23 solar panels for a total power of 5.0 kWp. This project is set up in a modular way in order to continue growing every year. Palmichal Mill has the biggest nursery in one single block in the country, a total of 330,000 plants and looking to grow next year. Majority of plants are “Obata” varietal, which is very resistant to rust, has very high yields and potentially a good cup profile. The plants are sold to producers at cost, with the opportunity of financing against future crop. Long time ago the Mill donated 42 hectares of land to re-forestation project the neighborhood (http://www.nacientespalmichal.com/en/about-us ). Costa Rica’s legislation regarding water treatment is very strict. Having everything run according by legislation doesn’t sound like a lot, but it is. All the water they use during processing have to treated and cleaned. The organic residues are transported and donated to a company that makes organic fertilizers.